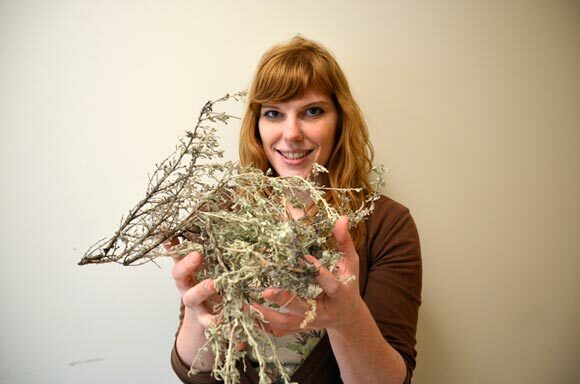 Christina Turi is investigating the potential medicinal properties of common sagebrush. Christina Turi works like a detective – the clues she follows uncover mysteries of the plant world. In the bright, gleaming science labs at UBC's Okanagan campus, Turi interprets the realm of plant signaling and behaviour, a branch of botanic investigation that examines how plants respond to their environment under changing conditions. Plants signal and behave in ways to share food, repel enemies, time their growth behavior to the seasons, decide when and whether to colonize other species and otherwise adapt to life. Turi studies the potential of medicinal plants – an area of interest springing from the days her European grandmother planted herbal remedies in her garden. She is currently researching the chemical complexity of two plants common to British Columbia -- Ligusticum canbyi, typically known as Canby's Lovage and Artemisia tridentata, or Sagebrush. "Both species have a long history of medicinal use in British Columbia. But they have not been fully studied," says Turi. That, in large part, is due to the complicated structure of vegetation – for instance, a plant leaf can contain upwards of 30,000 separate compounds. Scientists understand about 1,100 of those in terms of what they do for the plant and how they interact. The remainder have been catalogued, yet their specific roles and how they work together within a plant's physiology are undiscovered territory. "Our knowledge is very limited, as these compounds are often unstable or lost in processing," says Turi. To get a better picture, she arms herself with plant extracts, feeds the samples into a mass spectrometer and analyzes the results. Typically what spits out are reams of spreadsheets containing tens of thousands of figures, graphs and code language. This metabolic data provides a snapshot of the chemicals present in the sample. Employing algorithms and processes to understand biological activity, chemical structures and plant signaling, Turi mines the data to discover new compounds. Ultimately, she hopes to unlock the natural medicinal values of plants using statistics and rationale deduction to find patterns and connections. Upon graduation, Turi hopes to further pursue work with medicinal plants with an academic posting. She credits her supervisor Susan Murch, Canada Research Chair in Natural Products Chemistry, for sparking her work and encouraging her to follow it. "She is truly a multidisciplinary researcher, who does not just teach you the science. She teaches you to look at the world from a different perspective and appreciation." Turi’s thesis is tentatively titled "The Novel Use of Metabolomics as a Hypothesis Generating Technique for Untargeted Phytochemical Analysis of Ligusticum canbyi Coult & Rose and Artemisia tridentata Nutt."